Interesting this vertical fin with the arms of the Alsace Province deprived of all manufacturers indication. 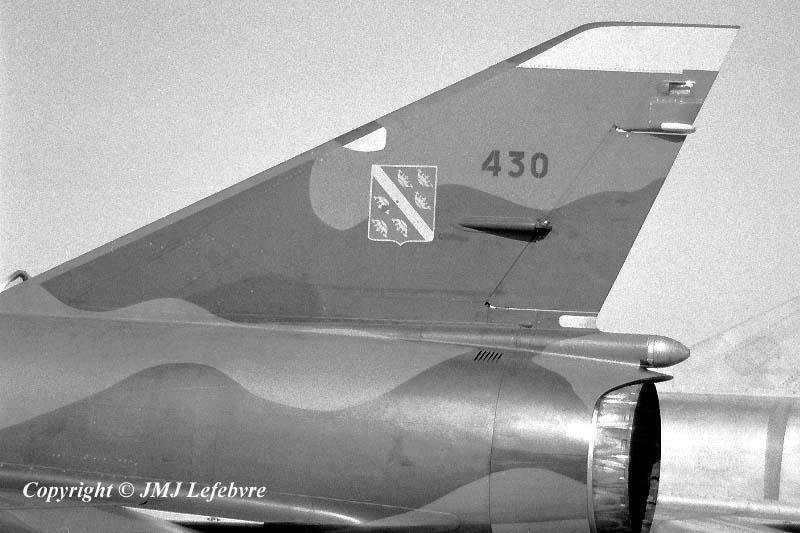 This Mirage IIIE, C/n 430, was registered F-UGLM and coded 2-LM and was coming from 13th Fighter Wing which used it under code 13-PM. Fighter Squadron 3/2 'Alsace 'having no traditional escadrilles, these arms are applied on each side of the fin. Born on 15 September at Rayak in syria it operated as a defence unit of Palestine, Egypt and Lybia before to install in England in January 1943 and became Squadron 341 RAF at Turnhouse from 21 January 43. With its Spitfire IXs it was installed at the Biggin Hill airfield on 20 March to mainly operate over Belgium and France and as part of 145th Wing flew alongside the French groups 'Cigognes', 'Berry' and 'Ile de France'. 27 victories, 6OO steam locomotives and other ground vehicles were destroyed for the loss of 31 pilots of Alsace Squadron. With peace, it was passed to Armée de l'Air becoming Groupe de Chasse GC II/2 on 27 November 1945 and, since, its story was parallel to GC I/2 'Cigognes' of which a short story is given with picture 36. 'Alsace' just had some changes in being second, next third and again second squadron of 2nd Fighter Wing.